Principle 2: The second principle is identifying critical control points. These are the points in the production process where an action can be taken to prevent, eliminate, or reduce a food safety hazard to an acceptable level. Principle 3: The third principle is establishing critical limits for each critical control point. 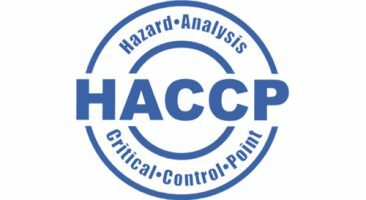 A critical limit is the limit at which a hazard is acceptable without compromising food safety. Principle 4: The fourth principle is establishing monitoring procedures for critical control points. Highly detailed monitoring activities are essential to make sure the process continues to operate safely and within the critical limits at each critical control point. Principle 5: The fifth principle is crucial: establishing corrective actions. These actions must be taken to bring the production process back on track if monitoring indicates that deviation from critical limits has occurred. In food production, correcting problems before end-stage production is far more effective than waiting until a product is finished to test it. Principle 6: The sixth principle is establishing verification procedures. Verification means applying methods, procedures, tests, sampling and other evaluations (in addition to monitoring) to determine whether a control measure at a critical control point is or has been operating as intended. 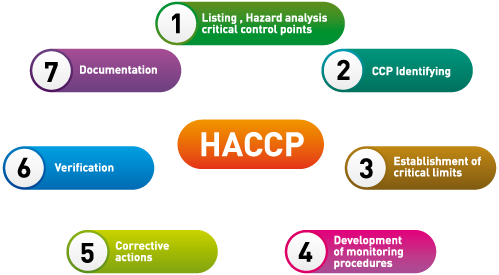 Verification activities also ensure that the monitoring and the corrective actions are done according to a company's written HACCP program. assist with official verification (which is done by the Canadian Food Inspection Agency).